of business for Ren's as later this year, Samir and Neal Idnani will open NaanStop in its place. Broad Street is home to a number of local restaurants. Local chain eatery Tin Drum Asia Cafe has a location on Broad as does Atlanta-based Moe's Southwest Grill. There was a KFC that later became a Checker's and also a Taco Bell / Pizza Hut dual branded store, but all have since closed. I'm told, however, that the former Checker's will soon reopen as Dua Vietnamese, offering take-out only, as opposed to their other nearby location that is dine-in only. Michael's Deli, and later Ren's, served a smorgasbord of menu items ranging from gyro wraps to subs and even a chicken biscuit. Michael's was a favorite of mine and had what I thought was a damn good gyro for the cost (under 5 bucks with my student discount.) Neighboring eatery Rosa's Pizza is a magnet not only for students, but nearby white-collars as well. The line for Rosa's often stretched well into the restaurant itself, at times leading would-be diners to other options, like Michaels. The funny thing is, neither Michael's nor Rosa's have a whole lot of seating, but each share in a large seating area below the restaurants themselves in a lower lever of the historic Healy Building (in which both restaurants are located). NaanStop will seat about 35 or so in the restaurant itself, but will share the underground seating. With plans for major interior renovations, the brothers hope to have the restaurant open by late July. 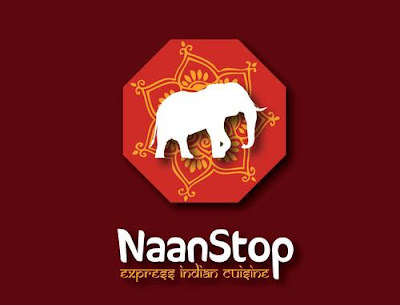 Neal and Samir hope that NaanStop will follow in the footsteps of other successful fast casual eateries launched on or near college campuses. The brothers tell me they plan to have a second location in the works by early next year and plan to have it open by the spring or summer. Feel free to comment below with suggestions for the new locations. I'm hoping for Decatur myself, but basically anything but the Prado is an option. Cool! This is my neighborhood and I've been wanting an Indian food option here for a long time. I can't wait. Sounds great! Always glad to see Fairlie-Poplar getting something other than a Checkers/KFC/Taco Bell. Although I've always thought a Chick-Fil-A would do gangbusters on Broad Street. Any word on what's planned for the two empty storefronts just opposite that space? Thanks for the enthusiasm guys! We are lookin forward to seeing you when we open up this summer. Don't know if you got this. Revolution Doughnuts, soon to open next to Ale Yeah! on College Ave. a block east of Wahoo in Decatur. Doughnuts, beer and Avellino Pizza in one little strip mall. Leading names being bandied about are "Carb Corner" (mine) and "Homer Simpson Plaza" (everyone else). Darin: You should check out Chutney's on Mitchell St.